Man I love this series! 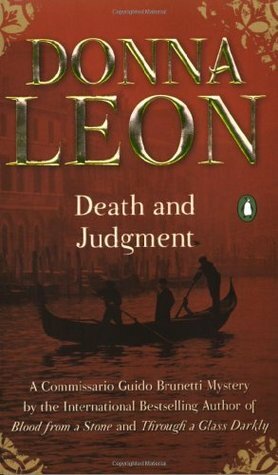 Commissario Guido Brunetti lands the investigation of the death in a train of a prominent local lawyer. A few days later, his accountant was found in his car with the engine on and the garage door down. Then, the lawyer's brother-in-law was also murdered. Brunetti is trying to find the link between the three men. Leon is one of those authors who doesn't feel the need to tie up lose ends. As often as not, the bad guy does not find justice. Well, maybe some sort of justice, but not the satisfactory kind. The thing I love about these books is the role his family plays in his investigations. In this book, his daughter decides to help in the investigation by talking to her friends about the daughter of the lawyer who was killed in the train. This leads to a scene in which his wife rails agains the girl's using her friends to get information. There is a long discussion about honor. "...we're talking about betrayal. And, if the people at this table will permit me the use of the word...honor"
"...What cannot be done is to lead our friends on to say things to us when we are alone with them and then turn around and repeat that infomration or make some use of it that they didn't know we had in mind when they were talking to us. That's to betray a confidence." The actual mystery is gritty and convoluted and sad, but Leon keeps all the strings separate, and keep it all straight for the reader. The books are set in Venice which is such a fantastic background, but it is almost a character in itself. Descriptions of the city are more intimate than what a tourist would see and the reader gets a feel for everyday life in Venice.